Dimensions 1 by 6.50 by 9 in. Amazon.com description: Product Description: In this age of emails, texts, and instant messages, receiving a letter has become a rare treat. Engraved stationery can make a piece of correspondence, whether a short note, formal letter, or business card, even more special. Once an integral part of social life, the use of engraved stationery has become a lost art. 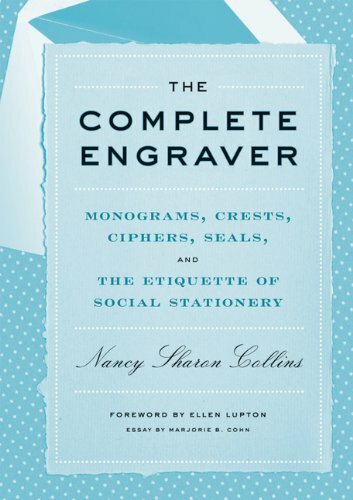 In The Complete Engraver, author Nancy Sharon Collins brings this venerable craft to life-from the history and etiquette of engraved social stationery in America to its revival and promise of new visual possibilities. Illustrated with gorgeous, original specimens of social stationery, calling cards, and monograms, The Complete Engraver also includes an instructional section that walks the reader through the engraving process and the steps required to commission engraving work today.